Some see the glass half empty, some see it half full... Luke Adams can see potential in all glass. We are getting to know one of our newest artists, and showing you what he's been cooking up in the studio. Q. 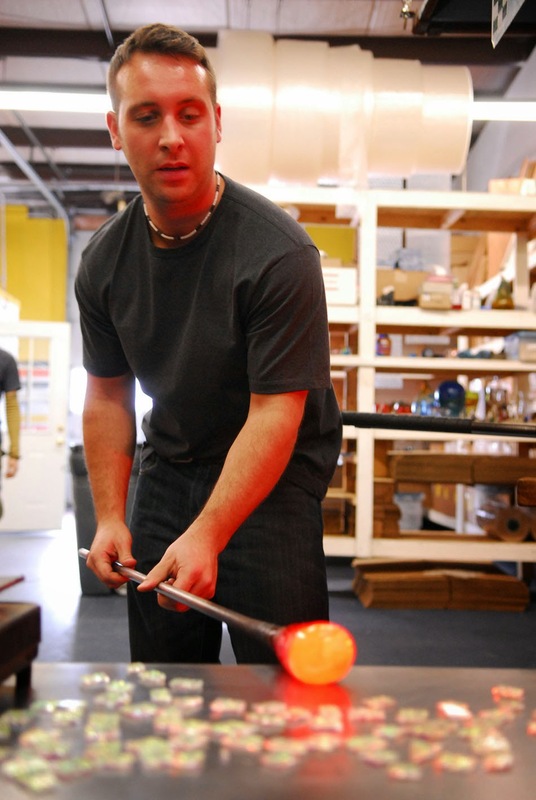 How did you get into the glass blowing business? A. I went to MassArt as an industrial design major. 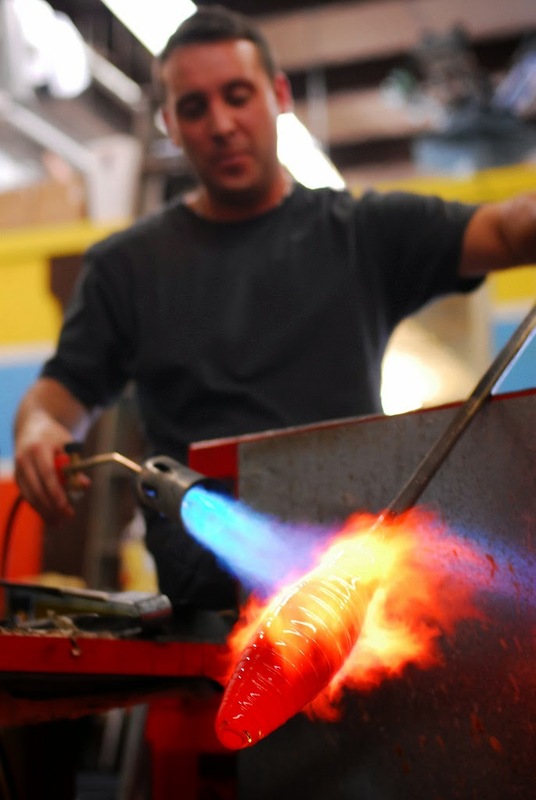 I stumbled into glassblowing and was lucky to have some great professors. I started the business right after college. A. My studio is located just outside of Boston, Massachusetts. Q. What made you choose this space? A. I chose this space for the very glamorous reason of transportation :) We are on a bus and train line and we are at the intersection of 3 highways. Q. What does the look of your studio say about you? A. The studio has a fun industrial feel. It's a working studio with a gallery and classes. When people come in they get to see what is truly an industrial glassblowing facility and at the same time a beehive of artists creating unique glass pieces. Q. Use 3 words to describe it. A. Hot, colorful and creative. A. My day can vary widely. I oversee my studio where we create pieces for galleries, my boutique retail store in Boston and my Glassblowing and Jewelry School where we teach more than 150 students per week. I like to blow glass 3-4 days per week, spend at least 1 day a week in the store and be available during the busiest class times. When I'm not doing one of those three things I am typically in the office planning our next steps as a creative company. Q. What do you do when you aren't working? A. I love riding my bicycle and my motorcycle in any weather that allows it. A. I am usually working on plans 6 months or a year away. I am planning for next years shows in Atlanta, NY and Philly/DC. I am also working on some one of a kind sculptures for some of next year's fine art auctions. Q. How do you keep yourself inspired? A. Travel is always a source of inspiration for me. Meeting new people in new places has always been an important part of my creative life. Q. Describe the customer you design your products for. A. It's always been my goal to offer something handmade and unique that anyone can afford. 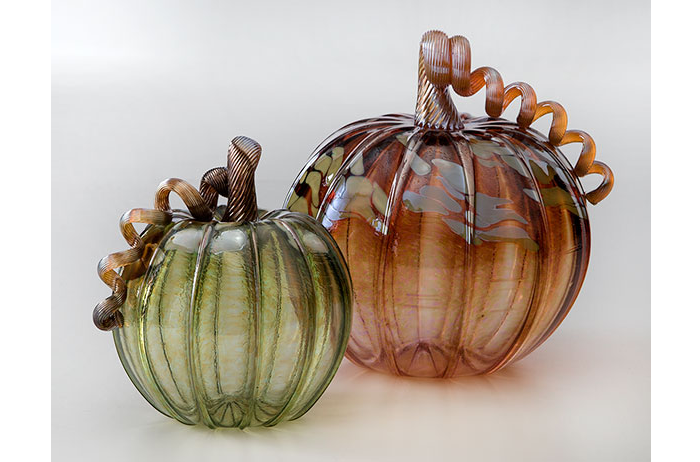 Click here to see our Autumn Glass Pumpkins, made right there in Luke's studio.